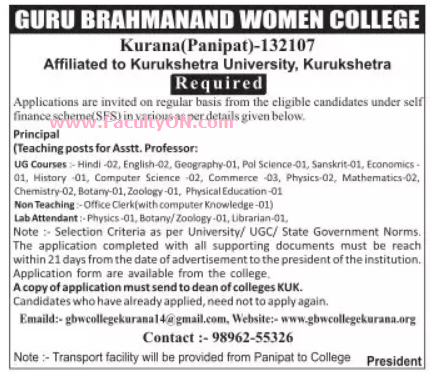 Guru Brahmanand Women College, Panipat has advertised in Tribune newspaper for the recruitment of Assistant Professor / Principal Plus Non-Faculty jobs vacancies. Interested and eligible job aspirants are requested to apply within 21 days from the date of advt 20th June 2018. Check out further more details below. About College: Village ‘Kurana’ is a large village of Teh. Israna of Panipat districtof Haryana. It is situated near Ahar-Kurana Chowk. It belongs to Rohtak Division . It is located 34 KM towards west from District head quarters Panipat, 17 KM from Israna. 191 KM from State capital Chandigarh.